The foraging activities of our bees are the focus of our observation. As we know, the collection of pollen is both necessary for the feeding of the bees, and the pollination (and thus reproduction) of the plants and creation of genetic diversity. While this fact is common knowledge, the time scales and distances involved make it difficult for most people to link cause and effect or have first-hand knowledge of the link between bees, plant reproduction and genetic diversity. Above: 6 frames from Rob King’s data visualization. View larger. This part of the project aims to draw a direct causal relation between bee pollination and plant reproduction by both to shrinking the time and distances involved in the process and linking the real-life act of bees collecting pollen with the growth of flowers in virtual/gallery space. A video camera has been placed at the entry point of the hive so that the comings and goings of the bees will be monitored. By swabbing the stamens of a variety of flowering plants outside with fluorescent dye insect tracking powders, it is possible to track which plants the bees are collecting pollen from. The camera identifies which plants the bees are likely pollinating by measuring the colour of pollen on their bodies as they return to the hive. 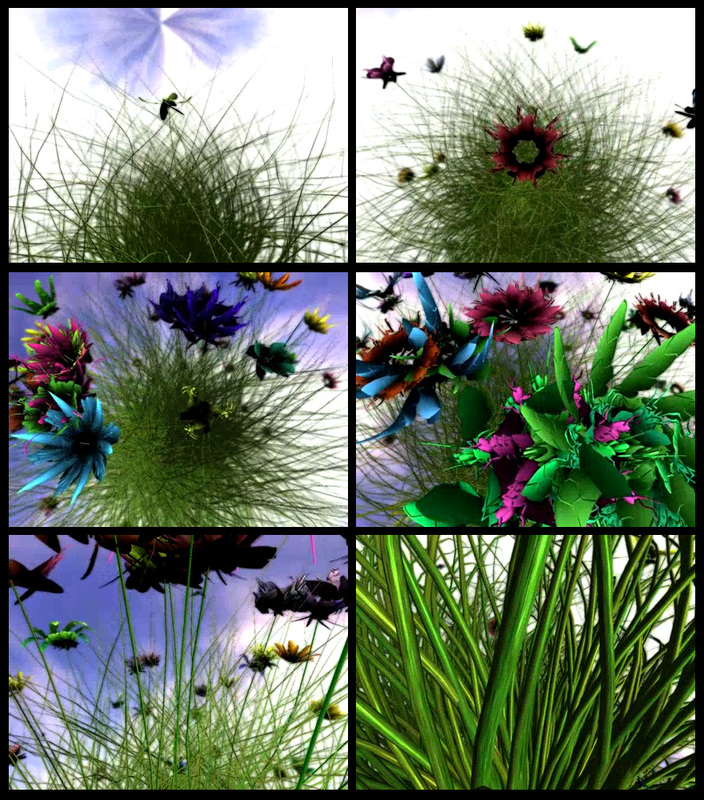 These data trigger the growth of virtual flowers within the gallery space. The form that the virtual flowers take are procedurally generated based on the genetic data (DNA sequences) of the plants which are tagged with fluorescent powder in the garden. The following 3 videos show three different aspects of Apiograph.